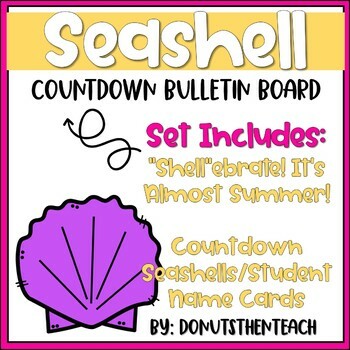 Create a perfect countdown to summer bulletin board with this SEASHELL themed set! This set includes letters to create "SHELLEBRATE! IT'S ALMOST SUMMER" It also includes cute shell clipart with numbers embedded. I have also included editable shells, if you prefer to add student names. Use a push pin to hold it on the bulletin board and remove each one as the days pass. What a fun way to countdown to summer break!